Suppose every member of Congress just went home for the 4th of July and didn’t return for the next forty years. What would happen to the deficit if Congress simply shut down and left everything alone—same taxes, same spending as planned? The non-partisan Congressional Budget Office (CBO) says under such a scenario, debt would never exceed 90 percent of GDP and could fall to about 60 percent by 2050. Take a look at this chart from the CBO. See that blue line at the bottom that trends DOWN. That’s what will happen if Congress does nothing. Now look at all the other lines—the bright colored ones. Those are the changes to current law and FIXES that everyone expects Congress will enact if it stays in session. In other words, THE REAL DEFICIT PROBLEM IS CONGRESS. Here is the CBO explanation of the bright colored lines on the chart. Doc Fixes: Under current law, Medicare physician payments are scheduled to be cut by 30% as part of something called the Sustainable Growth Rate. The AFS (and CRFB's Realistic Baseline) assumes politicians freeze physician payments instead. AMT Patches: The Alternative Minimum Tax is a secondary tax meant to capture high earners with low tax burdens. However, for a number of reasons, it now technically impacts middle-income families and so politicians pass annual "patches" to avoid this from occurring. Under current law, patches will stop while under the AFS (and CRFB's Realistic Baseline) they continue. Tax Cuts: Under current law, the 2001/2003/2010 tax cuts expire at the end of 2012, as do a number of temporary "extenders". The AFS assumes that policymakers make both permanent (while CRFB's Realistic Baseline only assumes the 2001/2003/2010 tax cuts continue). PPACA Cost Controls: The health reform law included a number of cost controls for Medicare and the exchange subsidies which are now part of current law but may prove unsustainable over the long-run. The AFS assumes that they are effective through 2021 but are overridden thereafter (CRFB's Realistic Baseline assumes they are partially overridden). Discretionary Spending Growth: By budget convention, the current law baseline assumes discretionary spending grows with inflation through 2021 (as does CRFB's Realistic Baseline). 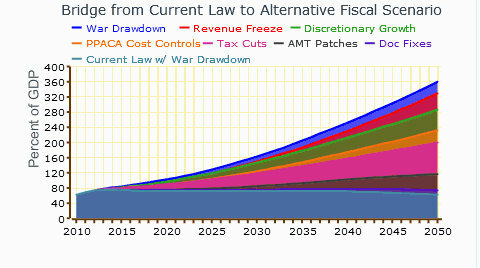 The Alternative Fiscal Scenario instead assumes it grows with GDP. Revenue Freeze: Were all the tax cuts (and AMT patches) to be renewed, revenue would still grow as a share of GDP due mainly to something called "real bracket creep" -- as well as due to the effect of the health care excise tax. However, the Alternative Fiscal Scenario holds revenue constant at 18.4 percent of GDP after 2021, essentially assuming that policy makers will enact future additional tax cuts. War Drawdown: By convention, CBO's current law baseline assumes all discretionary spending -- including for the wars -- will grow with inflation. However, the Alternative Fiscal Scenario (as well as CRFB's Realistic Baseline) assumes that troops will gradually be drawn down. Think about that. The easiest way to fix the deficit may be to just send Congress home and agree to send them their paychecks if they just don’t show up in Washington again for forty years.